Full disclosure: Several weeks ago I was contacted by the folks at AquaGear.com who offered me a store credit to use towards any of their merchandise. In exchange it was requested that I share a review of both the product and their site. The terms of this agreement have no bearing on the review below; in no way is my review tilted because of the credit I received. Having read more than my fair share of books and articles on the subject and watching countless videos on swimming form I know the importance of proper hip rotation in the water. Rather than swimming with your back parallel to the surface of the water, swimming on your side helps increase hydrodynamics allowing you to cut through the water. Throughout the course of my swim training I have spent many laps working through Total Immersion drills focused on body rotation and positioning. The Trainer is well-made and the strap which secures it around your body is sturdy and strong. The strap is extremely long and I suspect there are few that it won’t fit, but it was no big deal, just tuck it in. 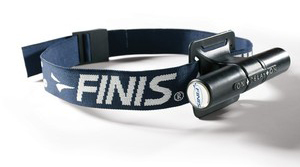 The closure clasp which locks the strap in place is secure and allows you to lock the trainer firmly into place. The plastic housing and the ball bearing also seem resilient and built for the long-haul. The Tech Toc does do what it sets out to do but it is a one-dimensional tool. After my first swim with it on, it was clear that my body rotation is sufficient to create the patented “tic-toc” sound. Besides the fact that the Tech Toc responded to my movement it really isn’t designed to do much else. To sum it up: for swimmers who lack body rotation I think that the trainer can help them to become aware of their body movement (or lack thereof). For those who have already incorporated rotation into their stroke, the trainer isn’t much use. I will admit that I have only used it once since the first time. Instead it has become a sort of automotive metronome as it tic-tocs from within my swim bag in the back seat. Now onto AquaGear…from the first time they contacted me the folks at AquaGear were great to deal with. AquaGear is a family-owned company and I can honestly say that it comes across in their customer service. Emails are promptly answered and their staff seems committed to serving their customers. The website is well organized and shopping around is pretty easy. In addition to searching you can shop by product category and also filter by brand. The store has wide range of product offerings for all types of aqua-activities. Pricing across the site is competitive to other online retailers and they offer a 30-day price guarantee. Orders on AquaGear are shipped the same day they are placed and delivery time depends on where the item is going. From the time that I placed my order I had the trainer in about 2-3 days. Overall, AquaGear is a great site for anyone interested in serious water activities. I use the word serious because AquaGear is not about games and toys but is instead focused on providing the necessary gear for swimming and other types of water exercise. Hopefully over time their customers will begin to write reviews on their products to help others make better choices about their purchases. I'll definitely look to AquaGear the next time I need any swimming gear.